Huawei tried its best to beat Samsung in releasing the first foldable phone but Samsung somehow edged it and was successful in releasing the first foldable phone at its developer’s conference. Samsung also displayed the new design models that the company will be adopting in the future. Among those models, the ‘New Infinity’ and ‘Infinity-O’ were the most popular one. With technology not there yet, Samsung decided to introduce the ‘Infinity-O’ display before introducing the ultimate design ‘New-Infinity’. 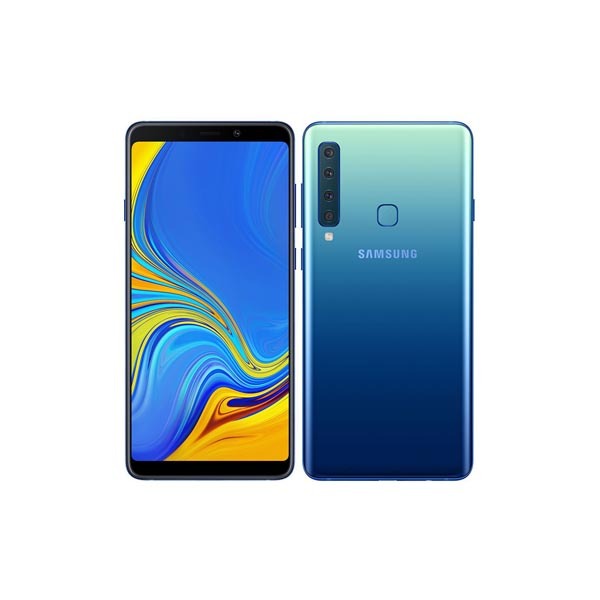 The Galaxy A8s and Galaxy S10 are both supposed to feature screens with camera holes at the top. However, it seems that Huawei is once again trying to beat Samsung at their own game, recent rumors suggest that Huawei might be the first company to introduce the ‘Infinity-O’ display. This confirmation comes in the form of a teaser image, which was posted on one of Huawei’s Weibo accounts. 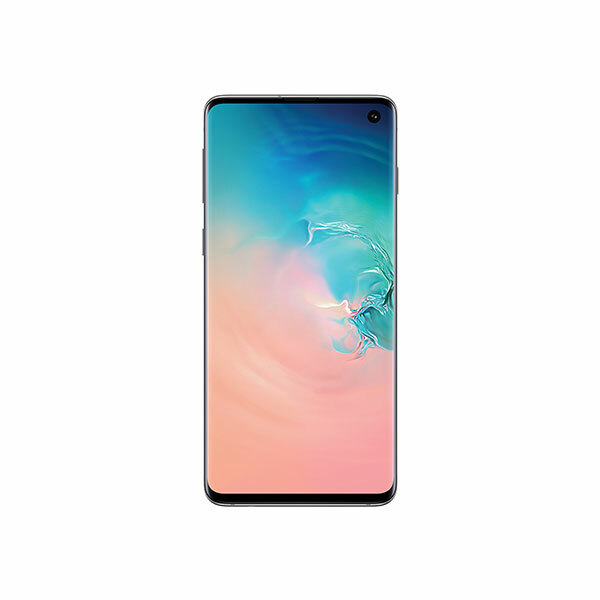 The image shows the outline of a display with a hole drilled in the top left corner of the screen, furthermore the image also hints at the possible release of the phone in the month of December. 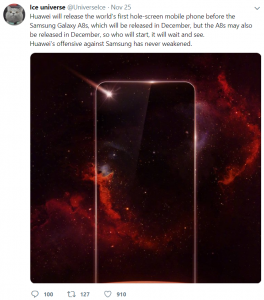 Earlier, it was believed that Samsung would be the first company to introduce this kind of technology in a smartphone display, however, Huawei’s latest teasing of their next unveiling has spiced up the matter. 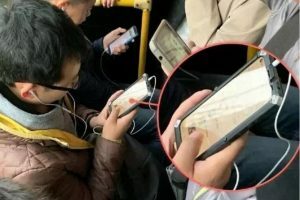 The highly-reputed Samsung leaker Ice Universe also confirmed this and asked the same question, that which will be the first company to introduce this display? This confirmation comes in the form of a teaser image, which was posted on one of Huawei’s Weibo accounts. The image shows the outline of a display with a hole drilled in the top left corner of the screen, furthermore the image also hints at the possible release of the phone in the month of December. 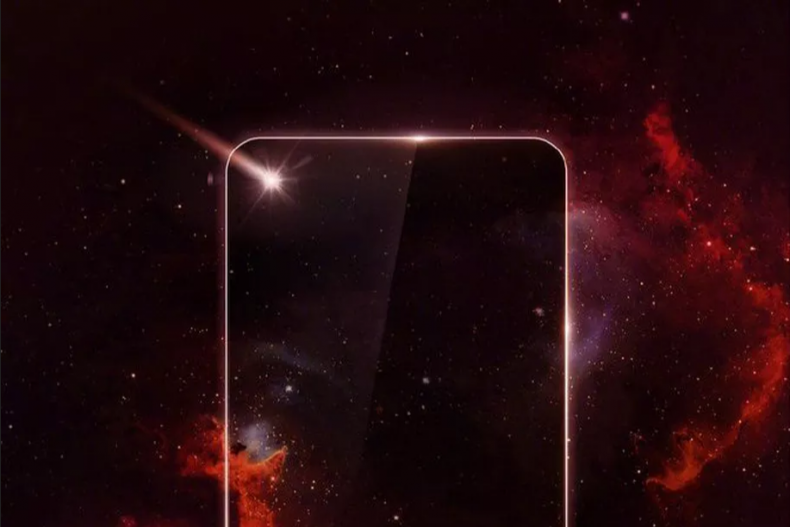 Some recent rumors and leaked images have hinted that Nova 4 would be Huawei’s first smartphone with an Infinity-O screen. The leaked image shows that the phone is also expected to have a headphone jack, a feature that has become archaic in today’s time. With Huawei teasing the ‘Infinity-O’ display, the race between the two giants is now on, for the title of the first company to introduce the phone with an in-screen camera cutout.